Before starting your passion project, you must determine and honour what your needs are. Following your passion and purpose is a worthy journey, but it is not always going to be easy. When you know specifically what you need out of your passion project and honour those needs, the journey will be more enjoyable and ultimately more successful. Starting a passion project is exciting and motivating, but there are bound to be setbacks and challenges. Make sure to leave time for the people and activities that fill you up and bring you the most joy. Create a support system you can lean on if you experience challenges. Practice visualisation and meditation to gain confidence and reduce stress. Remember that your passion project may start as one idea and evolve into an entirely new idea as it grows—and always take care of yourself as you change with your passion project. ​In the hot days of summer, you can either stand in front of your air conditioner all day long, or you can try some of these naturally cooling yoga poses between your ice pops and cold showers. As an asana category, forward bends are inherently calming to the nervous system and cooling to the body’s core temperature. Whereas backbends tend to heat and invigorate, forward bends are more easeful in nature, even if they are not always easy to perform. This pose not only stretches your hamstrings, calves, hips and back, but also relieves stress, anxiety, mild depression, and neck and shoulder tension. From standing, step wide on your mat with your feet parallel to one another, and bring your hands down to the ground. Spread your legs as wide apart as your hamstrings and back muscles will allow, but ideally are about one leg’s length apart. Try to keep your hips in the same plane as your heels, as there is a tendency to lean back, causing undue tension. The idea here is to get your head below your heart, which will reduce “hot-headedness” and invite an introspective quality that is emotionally and energetically nourishing. Bend your knees if you need to for this variation. When you find yourself in a steady and comfortable position, take 5-10 deep breaths, without constricting the back of the throat. On particularly hot days, try exhaling through your mouth to let go of excess internal heat. There are several variations of Child’s Pose, but this one is particularly restful, as you curl into a fetal position. Keep the knees and ankles close to one another as you sit back onto your heels. If your head doesn’t easily touch the ground, slip a block or pillow under your forehead. Reach your hands back to the outsides of your feet, with the palms face-up, and fingers effortlessly curled in toward the palms. Allow the shoulders to wrap around the thighbones in a passive and supported manner. Gently tuck the chin in toward the chest so the nose is free and clear for a natural breath. Stay here for a minute or more. Half-split (or Monkey Pose) enlivens the posterior chain of the body, but continues the action of folding forward, and honoring the interior self. From a lunge position, lower the back knee and straighten your front leg any amount. Adjust your stance so that your back knee is directly beneath the same hip. Unless you are very open in the hamstrings, you’ll likely want to use blocks to find more ease in the pose. Keep the foot on your extended leg active and flexed as you draw the femur back into the socket. Inhale and lift your heart, and exhale as you bow forward over your leg. The hamstrings might need 7-10 good breaths before they soften enough to provide the desired effect, so be patient with the pose. To come out, pass through lunge again, and return to a Downward Facing Dog or all fours, before moving to the second side. In the seated forward bends, the backside of the heart and body are exposed, making you more vulnerable, but also more trusting. For Baddha Konasana, bring the soles of the feet together and ground down through both sitting bones. If your low back is particularly tight, consider sitting up on a folded blanket so your pelvis can tip forward. As you bow over your legs, aim to initiate the fold from the pelvis/hips, as opposed to the mid back. Keep the lumbar spine long, and then round over with the thoracic and cervical spine. Reassure your physical and subtle body with slow and deep breaths as it surrenders to the stretch and you connect to the inner quietude. This pose gently releases tension in your back while also aids digestion and quiets the mind. Lie down on your back and hug your knees into your chest. Bring both legs to one side, and turn your head to the other side, staying grounded through both shoulders. Let your body be very heavy in this variation, so it becomes more about unwinding tension in the spine, than about stoking the inner flame of the belly. Although the legs are stacked, feel free to disorganize your limbs somewhat so you can find more ease. Breathe naturally as you soften into the floor like a block of melting ice. Try 5-10 breaths on each side. It may seem obvious, but Savasana is a perfect pose to practice when the weather is warm and you want to cool off. The ultimate restorative posture for body, mind, and spirit, this asana will help you find equanimity, a sense of resting awareness, and a reduced body temperature, in as little as five minutes. In addition to having naturally cooling properties, this pose is about being just as you are, without interference or manipulation. Lie flat on your back and release any tension or breath control. When you come out of the pose, roll to the left side (which is associated with the moon, and therefore, cooling in nature), and press up to your seat. Take a few deep breaths, and remember to drink plenty of water. Peppermint and ginger are two of my favourite healing herbs. I discovered peppermint when I was 10 years old and I have used it all my life for treating all my ailments. I discovered ginger 20 years ago when I had a bad cold and I needed a healing herb to help my immune system. I’m very deeply thankful for their healing medicinal benefits. I have a very sensitive delicate stomach and these wonderful healing herbs have helped me so very much in so many ways. What I love most about peppermint is the fact that it grows wild everywhere and there will always be a wonderful healing bounty of it. Ginger mainly grows in the Middle East and various other parts of the world, but both herbs can be planted and grown in your very own herb garden. I often drink peppermint tea when I don’t feel well and I need to burp and stimulate my appetite to feel strong. I drink ginger tea for similar reasons, but I also love to add fresh ginger or ginger powder to my delicious healthy meals. The strong pungent aromas are very healing. I love the flavors and aroma. I never leave home without peppermint. It’s energizing, cooling, a natural decongestant, and it creates a sweet, beautiful, positive, healing energy in any toxic negative environment. I carry a bottle of organic peppermint essential oil in my purse. I have three boxes of organic peppermint tea in my cupboard. I have 2 bags of ginger powder and 3 large pieces of fresh ginger. Next to garlic, which is also a wonderful, healing, medicinal herb, peppermint and ginger are herbs that no one should be without and I can honestly say that I would encourage everyone to have these in their first aid kit and medicine cabinet. Enjoy good health and healing wellness self-care. I’d like to share a delicious healing herbal tea recipe I make when my dear husband and I don’t feel well and need a gentle energy boost. It is a wonderful mixture of herbs that mix very well and is delicious. Let the hot tea steep and brew for 30 minutes until the herbs blend well and is very potent. When the aroma fills the air and the tea tastes very minty and gingery, you know the tea is ready to sip. You can enjoy this delicious healing herbal tea on cold days, but you can also enjoy it chilled on hot days. It’s wonderful to sip it slowly throughout the day and the herbal potency will help you feel good for hours. Enjoy and have a lovely day. Vedanta is one of the world’s oldest and most comprehensive spiritual philosophies. It is based upon the Vedas, or sacred scriptures of India and underlies the principles of Yoga, Ayurveda, and Hinduism. The word “Vedanta” has two parts, Veda, which means knowledge, and anta, which means the end or goal of. Therefore Vedanta means the end of all knowledge and where it concludes. This knowledge was “cognized” or perceived by sages and seers in higher states of consciousness, none of whom take credit for the information. It is eternal, universal knowledge that everyone has a right to and is not something that you believe in, read about, or simply understand intellectually, but something that you experience. Vedanta is also known as the Science of Spirituality. It’s not a belief system, an ideology, dogma, or a religion; It is a method for exploring the nature of reality. Many may find this definition to be contradictory or even absurd in that science and spirituality seem to be mutually exclusive terms that can’t coexist together. However, when you look at Vedanta through the lens of the modern scientific model, the reasons for this definition become clear. Observe some aspect or behavior of the universe. Collect information and make an educated prediction of what is taking place, known as a hypothesis. Test the hypothesis with an experiment. Record the results of the experiment which will either support or disprove the hypothesis. Draw conclusions, publish your findings, and ask your peers (fellow scientists) to validate and test your hypothesis by repeating your experiment. If the results of your peers agree with your findings, then the hypothesis or theory is considered to be scientifically valid. If they cannot replicate your results, the hypothesis is considered suspect and not an accurate description of how the universe behaves. When this happens, the scientist heads back to the drawing board to determine if there was a flaw in the experiment or possibly the hypothesis itself. If necessary, a new hypothesis may be formed and subsequent testing takes place until a consensus is reached by the larger scientific community. This unprejudiced and self-correcting process of hypothesis testing is at the heart of all forms of all scientific endeavour. Now, let’s see how Vedanta aligns itself with these steps. First, Vedanta makes the following observation: There seems to be a deeper reality beyond the material world and what the five senses report back to you. The inner world of thoughts, emotions, and perceptions feel as if they are somehow connected to the outer world of objects, time, space, cause, and effect. Second, Vedanta hypothesises that the separation you feel from the rest of the world is an illusion and that there is actually only one reality of pure consciousness, and your true nature is that of oneness with the immeasurable potential for all that exists, for all that was, and for all that will be. This one reality is eternal, was never born, and will never die. Vedanta also recognises that your experience of the world comes to you in one of four ways: a feeling, a thought, an action, or a sense of being. Bhakti Yoga – the path of feeling. This is the yoga of love in a human relationship or love for God; the relationship of the human soul to the universal spirit in all its aspects. Gyana Yoga – the path of thinking. This is the yoga of intellectual understanding and science; using the intellect to go beyond the intellect. Karma Yoga – the path of action. The yoga of selfless service, or service without attachment to the result or need for ego gratification. Raja Yoga – the path of being. The yoga of meditation and all its allied disciplines. In essence, Vedanta says: Here are the paths to self-realisation and enlightenment, each of which is appropriate to the nature of the individual seeker. Choose the path that is best suited to your temperament and run the experiment. Measure the effects of your practice, assessing your subjective experience, documenting the changes in your mind, body, perceptions, understandings, intuitions, and creative insights. Take note of changes in your awareness and look for clues that the gap between the inner world and outer world is growing smaller. Accumulate evidence of the evolution of your spirit in moments of lightheartedness, joy, and bliss along with the ease in which your desires are being fulfilled. Record experiences that indicate the transformation of the personal self into the universal self. Notice any signs that point to progress through the seven states of consciousness as described by Vedanta. Lastly, having performed the experiment, you are able to conclude whether or not the hypothesis of one reality is valid. If you have experienced it directly and have accumulated the evidence to support your findings, then you will know it to be true. You can publish or share your findings with your peers of fellow seekers in the form of writing or teaching that details your experience and encourages others to test the hypothesis as well. If, however, your experiment fails to produce results, if it fails to confirm the existence of the one reality Vedanta describes, then you are under no obligation to believe it and it should be discarded. Nothing should be taken on belief or faith. A philosophy should only be accepted if it has been tested and confirmed through direct experience. Do not believe in what you have heard. Do not believe in anything that has been spoken many times. Do not believe in conjecture. Do not believe in authority or teachers or elders. But after careful observation and analysis, when it agrees with reason and it will benefit one and all, then accept it and live by it. ​These guiding principles at the heart of Vedanta are what set it apart from other spiritual philosophies or religions. It applies the principles of scientific exploration to the realm of your own world of inner experience. It reminds you that the nature of reality is unity and encourages you to explore it directly and test the hypothesis using one of the four yogas. It puts the responsibility of self-realization in your own hands and encourages you to follow in the path of countless seekers over the centuries as they have made their way across the ocean of illusion … and back to the experience oneness. Summertime can usher in an energy of excitement as you begin anticipating longer days, warmer temps, and loads of outdoor activities. Family vacations, travel, barbecues, and fun in the sun are all things you may find yourself craving during the winter months. And let’s face it, when summer arrives and there’s fun to be had, you’re far more likely to table your previous commitments in favour of enjoying the season. Bear in mind that summertime brings an air of spontaneity and you may need to plan for variables. Again, the idea is to create the space in your summer to savour the season while staying on track. You may tend to be more active in the summer than you are in other months and that can take a toll on your energy levels. Living it up with friends and family may have you overindulging in food and beverages that leave you feeling heavier the next day. While fun activities like hiking, surfing, or sitting in the sun all afternoon are highly enjoyable, they can also be physically exhausting. If you’re blowing off your routine in favour of painting the town, you’re probably lacking mental clarity and motivation when it comes to making the time to work toward your goal. Here is an off-the-wall concept. Don’t think of distractions as distractions. Imagine for a moment that the distraction of an invite to the beach with all your friends when you need to hit the gym to stay on track with your health and fitness goals isn’t actually a distraction. Instead, think of it as an opportunity to hit the gym and then meet up with them afterwards. ​Ghee is essentially a form of clarified butter. The process of clarifying butter is a bit complex. The butter is melted and simmered in a pot or large saucepan until three layers form: a foamy, watery layer, which is skimmed off, a solid butter layer, and a milk solids layer. The separated butter is the clarified butter, a liquid mass of rich, golden butterfat. Ghee has quite a long history, as it has been used in Indian cooking for thousands of years. Ghee is an essential (and nutritional) element in much of Indian cuisine, much the way butter or margarine is used in American cooking. Ghee also transcends the cooking realm, as ghee is also often used in religious ceremonies and various healing arts in Indian culture. Ghee has many nutritional and health benefits as well. Chefs often use clarified butter because it will not burn during frying (this is known as a high smoking point), and it possesses a more buttery flavor. The longer the melted butter cooks, the more intense the resulting flavor of the clarified butter will be. Ghee lacks hydrogenated oils and is a popular choice for health-conscious cooks as well. Additionally, since all the milk proteins have been removed during the clarifying process, ghee gains further nutritional value because it's lactose free, making it a safer alternative for those who are lactose intolerant. Clarified butter is composed primarily of saturated fat. It contains approximately 14 grams of fat per tablespoon but no artificial additives, preservatives, or trans fats. Consuming large quantities of ghee is obviously unhealthy, but because of the rich flavor of ghee, it can be used sparingly to full effect, making it more suitable for low-fat diets. A good guideline is one tablespoon of ghee as opposed to four tablespoons of any other butter or cooking oil. Ghee is most notably said to stimulate the secretion of stomach acids to help with digestion, while other fats, such as butter and oils, slow down the digestive process and can sit heavy in the stomach. Although tests and research are still ongoing, it has been used in Indian medicinal practice to help with ulcers, constipation, and the promotion of healthy eyes and skin. An Ayurvedic remedy for thousands of years, ghee is also said to promote learning and increased memory retention. It is used in Indian beauty creams to help soften skin, and as a topical for the treatment of burns and blisters. In addition to ghee's nutritional value, it is rich with antioxidants and acts as an aid in the absorption of vitamins and minerals from other foods, feeding all layers of body tissue and serving to strengthen the immune system. A high concentration of butyric acid, a fatty acid that contains anti-viral properties, is believed to inhibit the growth of cancerous tumors. Shatavari has a wide range of benefits. A study published in the Asian Pacific Journal of Tropical Disease showed that the herb strengthens the immune system by enhancing the functioning of macrophages―the immune cells responsible for digesting potentially destructive organisms and cancer cells. Shatavari and the DoshasShatavari contains both the bitter and sweet tastes and has nourishing, soothing, and cooling properties that help with many conditions when the body and mind are overheated, depleted, or out of balance. Shatavari is traditionally taken mixed with a glass of warm milk and sugar or honey, but can be mixed into a wide range of dishes, drinks, and teas. The recommended dose is 500 to 1,000 mg twice daily. The arrival of summer marks a special time in the seasonal cycles of the planet. Astronomically speaking, summer is the season in which the earth’s rotational axis is tilted more toward the sun, maximising the amount of sunlight reaching either the northern or southern hemisphere. The days are longer, the weather is warmer, and energy is abundant. Apart from its technical definition, summer has a host of additional, more figurative qualities that give this season a unique character all its own. Summer embodies many positive emotions and connotations, and due to its special place in the cycle of the seasons, it ushers forth distinctive qualities of consciousness with which everyone can relate. Known as archetypes, or archetypal energies, these elements are deeply woven into each person at the level of the collective soul. It is from this level that you can call upon these archetypes to help you live the life of your dreams. The following four archetypal energies are fundamental to the summer season. Become familiar with them, and use the meditations to invoke them into your life. Capture some of this energy by recalling the freewheeling joy of running through a sprinkler as a child or the fun of a family picnic. Find a quiet place to sit down comfortably and close your eyes. If you choose to meditate outside, make sure to avoid sitting in direct sunlight. Bring your attention to the sensations of your breath. Do not attempt to control or manipulate your breathing; simply allow it to be natural and effortless. Spend five to seven minutes focusing on your breath and settling into stillness. Now, begin to call forth the youthful vitality of summer. Imagine running through the grass in your bare feet. Smell the sunscreen on your skin as you jump into a pool of deep clear water. Plop down on the cool grass and enjoy a picnic lunch while the warm breeze blows through the leaves of a large tree overhead. Unlike the spring when new life is just coming forth, the summer is the period of full bloom. Fruit is ripe on trees, meadows are lush and sprawling, and life reaches its peak of energy and expression. The summer solstice embodies adulthood and the prime of life. Now, imagine sitting around a crackling campfire sharing stories and knowledge with friends and family. You are the confident, mature leader of your group. You feel safe, strong, and experienced. You provide support and guidance to all who need it. These feelings may be directed toward a significant other or partner, or they may find expression in everyday life outside of a relationship. Like waves of flowers taking root in fertile soil, romance and relationships often grow deeper during the summer months. The warmth of the weather helps to warm your heart, opening you up to deeper connections and intimacy. Now, visualize yourself walking hand in hand with your beloved, your summer love. Feel the sensations of opening yourself up and being radically intimate with those you love. Share your love, attention, and affection with your partner or spouse, and allow the sweet sentiments of deep love to fill your being. Repeat to yourself, “I embody the love and romance of summer. I willingly give my attention, affection, and love to the world. During the summer months, daylight is abundant. The summer solstice marks the longest day of the year, giving you the greatest exposure to the sun. You can stay outside longer, enjoying the additional rays of sunlight that nourish all life on earth. With the light of summer, you can see more clearly, both physically and spiritually. Light is a symbol of both awareness and self-illumination. The light of awareness can be used to “enlighten” your stuck spots, or those places hidden in the shadows, allowing you to grow and blossom into your true self. Find a quiet place to sit down comfortably and close your eyes. Now, see yourself in your mind’s eye, standing in an open field of grass, face up to the sky. With your eyes closed, draw in the light of the sun so that it may illuminate the deepest levels of your being. Call forth the sun’s awareness to shine wakefulness and light into every aspect of your life. Intentionally tapping into these archetypes through meditation will help you move in the direction of your deepest desires. After you finish meditating with the archetype you chose, finish your practice with the Gayatri prayer. ​Allow yourself to rest in these feelings of summer for as long as is comfortable before opening your eyes and gently returning to activity. ​im·per·fec·tion / impərˈfekSH(ə)n/: the state of being faulty or incomplete. Have you ever wondered if there was such a strong epidemic of perfectionism before the rise of the Internet and social media? When you couldn’t see how well everyone else was supposedly doing—how perfect their made-from-scratch dinners look, how pristine their living room is amidst the toddlers running around, and how smooth and texture-free their skin looks in a bathing suit? But alas, you live in a world of non-stop comparison—where it takes a very healthy mindset, a higher level of perspective, and strong internal fortitude to not be bogged down on the daily with evidence that you’ve somehow fallen short. While you have role models of the perfect parent/spouse/successful human being, what you actually need is role models of imperfection—people with viewpoints that show you how to embrace your imperfect selves with acceptance and even celebration. This is not to say that you should all just give up and stop trying to improve; it is your nature to grow, expand, and flourish. However when you hold yourself to impossible standards, you ultimately set yourself up for depressive symptoms, disordered eating and thinking, and myriad forms of suffering that are absolutely avoidable if you can shift your perspective on the whole thing. 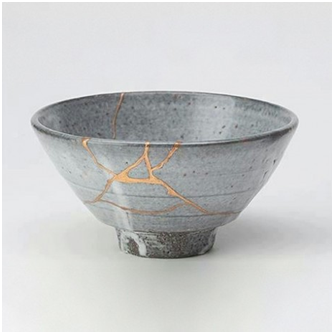 Here are five views of imperfection that can help you to soften your expectations of yourself, embrace your incompleteness, and hopefully create more room for beauty, compassion, and contentment as a whole. You can learn a lot about how you handle the imperfect in your life by first examining how you view others’ so-called imperfections. When a baby is learning to walk, he/she falls down hundreds, if not thousands, of times before he/she masters the concept of walking. Obviously, you don’t judge or criticise the baby when he/she makes a mistake. Yet you can come down hard on yourself for your wrongdoings all the time. This isn’t to say you should treat yourself like a baby, but rather that you should be as compassionate with yourself as you are with others. You certainly wouldn’t see your infant as any less for not being a flawless walker, so watch your negative self-talk and praise yourself for the efforts and attention you give to your pursuits. Try surrounding yourself with asymmetrical, vintage, and handmade art as a way to practice this skill. When you train yourself to see beauty because of imperfections, rather than in spite of them, you soften your expectations of yourself and those around you. So are you supposed to be so easy on yourself that you stop trying to improve? She goes on to identify the qualities of courage, compassion, and connections as key to making peace with your nature and strengthen your sense of worthiness. Through self-inquiry and honest communication, you must regularly remind yourself that, “no matter what gets done and how much is left undone,” you are enough and worthy of love. If you strive to improve yourself from an authentic place of self-compassion, gratitude, and intuition (among other whole-hearted qualities), you will experience more freedom, love, and joy, rather than feelings of inadequacy. How many times have you avoided meditating all together because you didn’t have your cushion, candle, and a full 20 minutes? Rather than taking five minutes to be quiet with yourself among the mess of your living room, you skipped the quiet all together because the circumstance didn’t look exactly the way you wanted it to. Let’s not wait until every situation is “perfect” to take action and truly live your life. Because the truth is, five minutes of meditation is better than zero. The Indian spiritual tradition of Tantra has greatly influenced yoga, and by practicing it, you can work to “remember” the true Divinity of human nature. According to Tantric philosophy, people suffer when they forget their true nature. In his book Tantra Illuminated, Christopher “Hareesh” Wallis describes one of the most fundamental forms of ignorance as the “deep unconscious belief that (we) are incomplete and imperfect, tiny insignificant creature(s), and certainly not the Divine.” When you look at it this way, that every fault you have is actually worth embracing because you are yourself divine, it’s a lot easier to see the broader picture and take a higher perspective. The Tantric view also reminds you that not only is there nothing wrong with the way you are, but every experience is in fact sacred in one way or another. Through your yoga and meditation practice, you can connect to the experience of purnata, which in Sanskrit means “perfect fullness or completeness.” Just because parts of the moon are invisible to the naked eye on 29 out of 30 days, it doesn’t mean the moon is not still perfectly whole. Tantra helps you to stay strongly connected to the inner knowing that you are divine, and that in your divinity, you are just as you should be. Perfection is not the endgame in our lives as human beings; if it were, we’d surely all be disappointed. If everything came easily, and we were met with no contrast, we’d lose our way indefinitely. And besides, what fun would life be? Sports games are enjoyable and meaningful because there are obstacles in the way of the goal. How one moves around and through those obstacles is what makes them a good player. Try focusing on the game-play—as opposed to the score—and see if it shifts your experience. The first step in changing anything is awareness. Through your meditation and contemplative practices, pay attention to the moments when you criticise yourself or others for not stacking up to a certain ideal. Notice your habits of thought, and ask if they’re serving you well. If you find yourself constantly disappointed, unhappy, or overworked, consider shifting your perspective to embrace the nature of your uniqueness as your special fingerprint on this world. Then, take action. If social media makes you feel bad about yourself, take a hiatus or quit it all together. If the people you surround yourself with elicit a negative energy from you, connect with people with a more positive energy. If you self-sabotage by not doing things you know are good for you because the circumstances don’t seem just right, remember that sometimes just getting out the door is the hardest part. And finally, accept the idea that you were never meant to be “perfect”, you were only meant to be perfectly YOU. Celebrate your cracks, your flaws, and your human-ness—and your experience in this lifetime will be far more enjoyable, inspiring, and beautiful. ​Stress is usually characterised as an unpleasant and unwelcome feeling that expresses itself both physically and mentally. The effects of stress range from irritability and anxiety to raised blood pressure and heart disease. When you think of stress in these terms, it’s no wonder you spend so much time trying to manage or avoid it altogether. But what if, instead of stressing over how to rid your life of stress, you focused on ways to use it to your advantage? What would happen if you perceived stress as a helpful companion with benefits to offer rather than as an irritating foe out to make your life harder? As Dr. Kelly McGonigal describes in her book The Upside of Stress, it is this shift in mindset that allows you to have a healthier, even beneficial relationship with stress. Dr. McGonigal, a health psychologist, once shared the same stance a majority of health professionals have adopted: stress is bad and you need to eliminate it immediately before it affects your health. However, she discovered that perceiving stress through such a negative lens can actually be harmful to your health. On the other hand, when you view stress as a helpful tool and motivator, and learn how to harness it to your advantage, your health is less likely to be negatively affected. In fact, stress may actually be good for you if you learn to embrace it and use it properly. Stress can serve as a great motivator for reaching goals or accomplishing simple tasks. Whether it’s landing a new job promotion, meeting a deadline, or tackling a to-do list, a little stress can push you to take action. If you didn’t feel any stress at all, you might not feel inclined to break out of your comfort zone, which is essential for personal growth. If stress has its benefits, then how do you take advantage of them? How can you make stress work for you rather than against you? As previously discussed, how you view stress can determine how it affects you. Retraining the brain to view stress as a helpful tool rather than a roadblock will take time as the latter has likely become deeply ingrained. While it will take some practice, it is possible to change your response when stress rears its head. Replace the negative thoughts that typically arise at the first sign of stress with more positive ones, such as, I’m experiencing stress and welcome it fully. Then, think of how you could best use it to solve a problem or reach a goal. How can you make the stress work for you? Tip: Don’t stress over trying to think of a way to best use stress! This strategy will get easier over time. If you’re unable to think of how to take advantage of whatever stressor you’re facing, simply accept that it’s there. Sit with it rather than flee from it. When you attach purpose to a difficult situation, it becomes easier to handle or, at the very least, motivates you to handle it. When you reframe stressors in order to add meaning to your life, you are giving your stress a positive purpose. Perhaps its purpose is one of the above benefits discussed such as motivating behaviour, building resilience, or boosting cognitive performance, or it could be something else entirely. Pairing stress with a purpose will allow you to broaden your perspective as to why it exists and the benefits it provides. Sometimes you feel stressed and can easily identify the cause; other times you’re unsure where it stems from. Pinpointing the root cause of your stress puts you in a position to work with it rather than against it. When you feel the symptoms of stress, either physically or psychologically, but don’t know what’s brought it on, you may feel as though you aren’t in control of what’s happening. However, identifying its origins and approaching it within a more positive framework puts you back in the driver’s seat. Stress is a part of everyday life, and as much as you might try to will it away, it will inevitably creep up again. By making stress your ally, you can learn to use it to your advantage and perhaps even learn something new in the process. So next time you’re feeling stressed, accept it as part of the journey and embrace it whole-heartedly. You might be surprised by the result.